When Jo Malone reached out and asked me to create my perfect, relaxing bath routine it took me about all of two seconds to select everything. My favorite part about Sunday is finding a little bit of time to run a hot bath, add a few extra pampering steps into my routine, and really feel prepped for the week. Along with a hot bath and some extra skincare steps I love to light candles, grab a stack of magazines, and finish off the day with a cup of hot water and lemon. All of these things combined create the perfect, calming atmosphere that gets me ready for the week ahead. The bath oil I selected is a new fragrance for me, but one I was especially excited to try. The White Jasmine & Mint is the perfect combination - it's floral without being overly sweet. The mint cuts the fragrance perfectly and gives it a really clean, fresh scent. The oil leaves my skin super soft, a perfect product for this crazy cold days we've been having recently. For the hand & body wash I went with Lime, Basil & Mandarin. I love the crisp, clean scent of this one and have decided it works perfectly on my bathroom counter as a hand soap. Since I frequently wear the Peony & Blush Suede Cologne I decided to keep my body crème from the same fragrance line. This cream has to be the most luxurious one I own. Super thick, hydrating, but dries down quickly. What is your nighttime routine/your favorite way to relax and unwind? *Gifted sample. 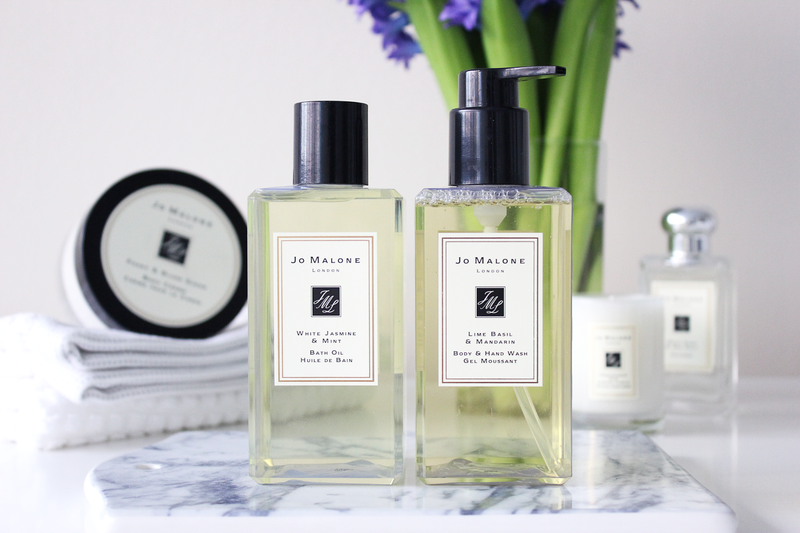 While I worked with Jo Malone on this post I was not compensated & all opinions are my own. It is definitely a hard thing to pick! I think my number one scent is the Wood Sage & Sea Salt for sure. It's the best! Tonight is the perfect night for a good relaxing bath! Yum, "Peony & Blush Suede" sounds amazing! I'll have to try that one out. Baths are definitely one of the best ways to keep warm during these cold days - especially if wine is involved. It's such an amazing floral! Ah yes - wine and a hot bath. Sounds like the perfect remedy for this crazy cold weather. 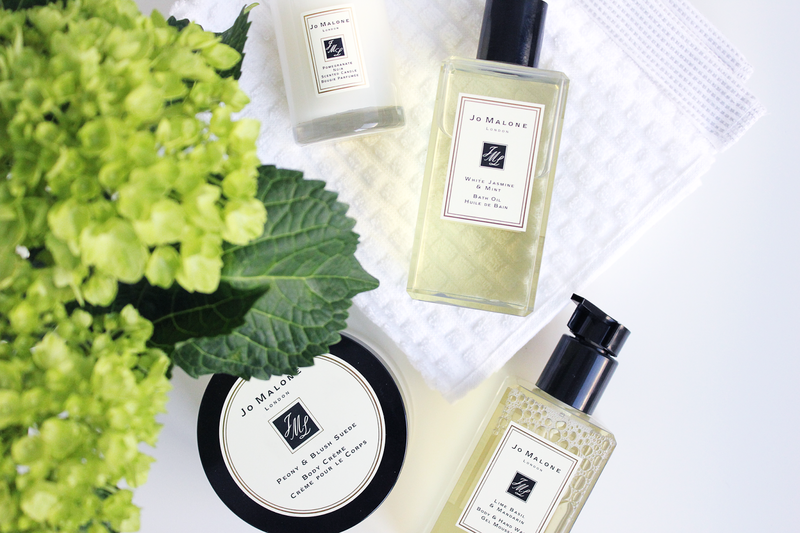 I love Jo Malone products. I just purchased my first fragrance and am already eyeing up another one. I bet their bath oil is amazing. So exciting! What fragrance did you snag? Their packaging is beautiful! I would LOVE to try the jasmine mint fragrance! What a refreshing scent for spring! Hopefully you are keeping warm up there today as well! I usually enjoy cozying up on Sundays, but 3 pairs of socks to keep warm has me frustrated with the cold! Their packaging is just the best - so minimal and clean! The best thing ever is opening up one of their boxes. I'm with ya though - so over this cold weather! There is nothing that beats Peony & Suede Blush in my opinion! That was my first Jo Malone fragrance! I love it! White jasmine and mint sound like a heavenly scent combination. I definitely need to try it out for myself! It definitely is! I highly recommend it!